Want to have a Quince that is trendy and elegant? This year, Pantone’s 2016 colors are Rose Quartz and Serenity, two colors that you’ll want to include in your Quince theme. Rose Quartz is a gentle, warm tone that conveys a sense of striking composure while Serenity offers a soothing, mild tone that reflects its peaceful and easygoing nature. Together, these two colors can blend seamlessly to complement each other, giving your quince a stylish feel. The color Serenity –a light, baby blue tone—gives a feeling of quietness and peace. For this reason, it is a good choice to integrate it in your table setting. 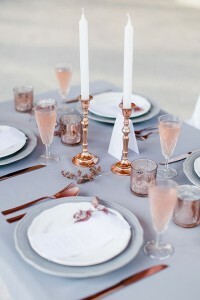 Try a Serenity colored table cloth and use Rose Quartz as an accent color for the decorations. Incorporate the cool blue in your napkins and place setting, and use Rose Quartz as to highlight and contrast against the blue. 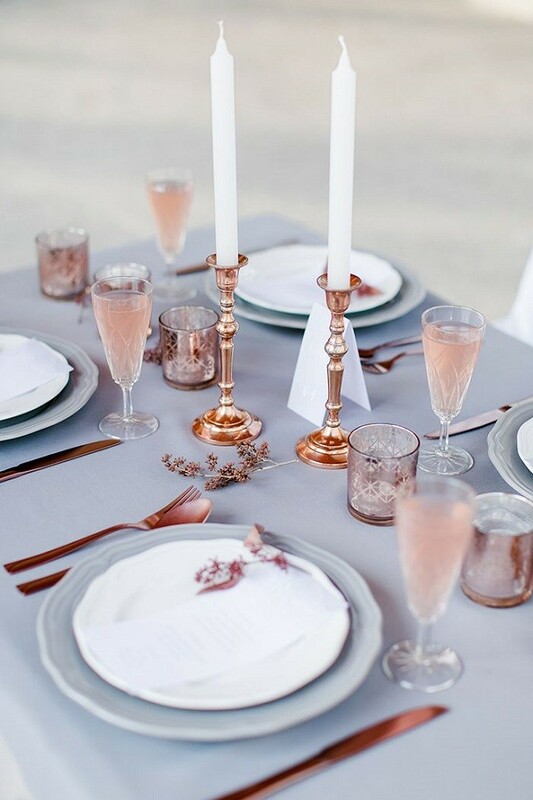 Using both of these colors together will give your table setting and quince decor an enchanting touch. For both the honored young woman and her guests, having an entrance that is unique and spectacular will provide the feel that the celebration deserves. Stringing fairy lights above the walkway makes the perfect entrance for you and your guests. The delicate, white lights will not clash with the Rose Quartz and Serenity colors and will simultaneously add a subtle touch to the party and just the right amount of elegance to amaze your guests. There is no limit of the amount of ideas you can have with the colors Rose Quartz and Serenity. For a girly cake that will take the center stage of your party, opt for a white cake and dress it up with Rose Quartz-colored decorations like flowers and bows. If you’re opting for other sweet treats, try decorating cake pops, cupcakes, or even French macaroons with the blush pink and light blue colors. A tall flower centerpiece will bring attention to your guests and a lavish look to your quince. There are many ways to decorate your quince centerpiece. For example adding lights, lace, pearls to the vase or the kind of flowers you choose will give it a different look. Use baby’s breath to decorate between flowers. Don’t want such harsh, dark pinks and blues? Try light pink roses instead. If you can’t find the shade you want, you can even dye your own white flowers using colored water to achieve the shade you want. Skip the crazy dark colors for your quince dress. A Rose Quartz or Serenity colored dress will give it a warmer, elegant look. If you’ve always wanted to be Cinderella, choosing a Serenity colored dress is the perfect way to make your childhood dreams come true. Are you more of a Sleeping Beauty girl? Select a gown in Rose Quartz for a dreamy, light dress that imitates Aurora’s. Don’t know how to incorporate this into your court? Another option is to wear a white dress with silver or gold sequin accents and have your court wear Rose Quartz or Serenity dresses and suits. It’s no secret that two are better than one, and with Pantone’s Colors of the Year, you can get the best of both worlds by incorporating Rose Quartz and Serenity into your Quince look for a gorgeously striking Quinceañera that will be remembered for years to come!